I may have a bit of a cookbook hoarding problem. Just last week I did another purge of my collection. Five lonely little books had to go. If I haven't made anything out of them for a year or two, they have to make room for the newcomers. Some books, however, will likely be safe forever. These books are usually the ones that bring back special memories (I'm looking at you, Purity Cookbook, circa 1967). I remember very fondly this tattered old book as being the first book that I baked chocolate chip cookies out of when I was probably 8. If you're doing the math, no, I haven't aged suddenly. My mom had a copy of it that was given to her by my grandma. A few years ago, it was put back into print, and it was the best Christmas gift I could have asked for from my mom. Others are ones that I simply collect. I have Atco-Blue Flame Kitchen Holiday Cookbooks dating to the late 80s. Every now and then I find one at a garage sale or on kijiji and am thrilled when it's a year I'm missing. Anyone out there have a 1992 or 1994 they would like to part with?! ......Ugh. I'm such a cookbook nerd. Anyways, my point is that I am passionate about cookbooks. It's #CookbookMonth, and Amy from Amy's Cooking Adventures is hosting a Cookbook Compilation roundup. She thought it would be fun to pick a recipe from a favorite community or compilation cookbook of some sort, and I agree! Check out all the links at the bottom of this post, where you can find faves from a variety of talented bloggers. I immediately wanted to take part because some of my favorite cookbooks are community compilation types. I thought it would be so easy to pick a favorite recipe and write about it. Well, I was wrong. I have DOZENS of compilation cookbooks. Since each one of these is still on my bookshelf, and survived all the purges over the years, it means that there are easily hundreds of faves in all of these books combined. So, instead, I simply chose to try a new recipe out of one of them. The book I chose is one that practically lives on my counter at this time of year. It's called "In Season - A harvest of Okanagan recipes from Davison Orchards & friends". I bought it on one of our summer trips to Vernon, British Columbia several years ago. According to the foreward of the book, Davison Orchards has been around since 1933. It's one of our favorite stops when we're in the area. There's a petting zoo for kids, lots of fresh produce for sale, preserves, and pies. Oh, the pies...... Anyways, on one of these trips, I purchased this cookbook, which contains beloved recipes from the Davison family, their friends and neighbours. Every year, when I have an excessive amount of tomatoes, peppers, zucchini, peaches, pumpkin, apples, or pears, this cookbook is my go-to source for ideas. I have never made a failure out of it. 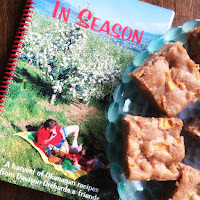 This time, I made one of three Apple Cakes included in this book. (I've already made one of the others last year). This was contributed by someone named Cindy Welkie. Cindy - whoever and wherever you are, this cake is perfect. It gets better every day that it sits on your counter...not that it lasts that many. I recommend vanilla ice cream with it, but plain, right out of the pan is awesome too. 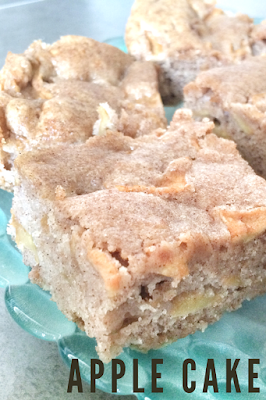 Combine canola oil, apples, sugar and nuts. Add vanilla and slightly beaten eggs and combine with the first mixture. In a separate bowl, mix flour, baking soda, cinnamon and salt. Add to the apple mixture and pour into a greased 9x12 pan. Bake at 350F for one hour. I cannot resist picking up cookbooks when on vacation. I love learning of other cultures and communities through food. Great seasonal recipe. Thanks for sharing. Yummy! I have a cookbook problem too... My all time favorite is my home church's from the 90s. Davidson's Orchard sounds like a wonderful place to visit! 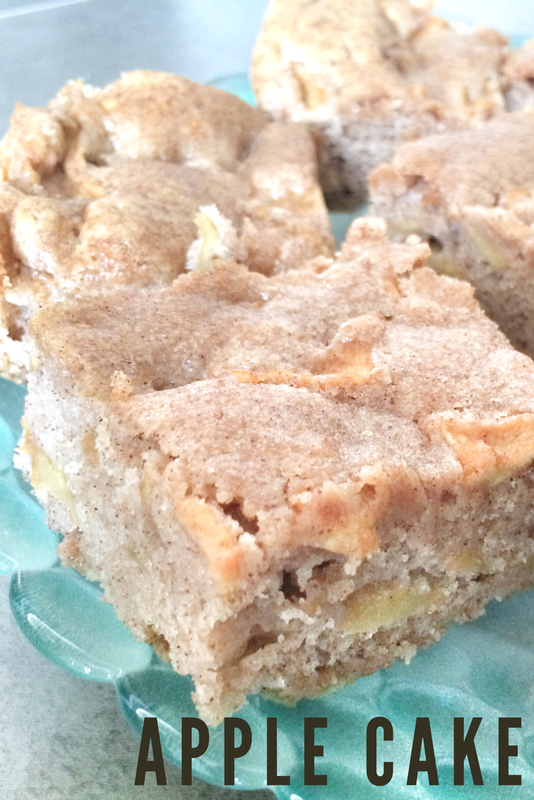 The apple cake looks amazing and perfect for fall. I like to collect cookbooks from my travels too! That is really cool! I totally have a cookbook problem myself. I applaud your ability to actually part with five! P.S. Your cake looks and sounds delish.